Happy New Year, and I wish everyone the best for 2017! 2016 was a year filled with challenges in the New York City real estate market, as prices moderated for the first time in over five years. Tremendous growth in the luxury new development sector resulted in a glut in unsold supply, and equity market volatility, geo-political concerns, and modest economic growth presented a challenging combination in the face of record high prices. As I’ve mentioned in previous Katzen Reports, the minor correction we saw in home prices was not unexpected, and in some ways, is a healthy and natural dynamic in any asset class. As we look forward to 2017 and beyond, the status quo has the potential to be challenged more so than it has for quite some time. Of course, I’m speaking of the impact of our incoming new President, a candidate who won the election based on his promise of change. Combine this with a Republican-controlled Senate and House, and the likelihood of change (for better or worse) is higher than its been in well over a decade. The details of Mr. Trump’s policies are yet to be seen, and just how (and when) they will be implemented is uncertain as well. Nevertheless, I thought I’d offer a few observations on what a Trump presidency could mean for our market. Let me start by saying my views are politically agnostic; I am simply trying to identify what actions may occur and what impact they may have on real estate conditions here in the City. As I’ve said in the past, the NYC real estate market is a microcosm unto itself. It doesn’t behave like most other markets here or abroad. While there are an endless number of both fundamental and technical drivers of NYC real estate prices, it is impossible to ignore the profound impact had by the finance sector and the “one percenters” of the world. Prices here are endorsed or dismissed by those that shop in a market that is unique to most others in the world. Thus, much of my focus has been on how Mr. Trump’s policies may impact the behavior of the buyers I’ve seen to be most impactful on NYC market trends over the last decade. Without a crystal ball in hand, here we go . . .
Taxes. With a contemplated lowering of income tax rates across the board including those at the top, buyers will have more disposable income to spend. Yes, Mr. Trump also plans to cap tax deductions, but in most scenarios, this is nowhere near enough to offset the decline in marginal tax rates. While the timing of a potential tax cut clearly is important, the expectation of one also should impact current behavior. The actual or anticipation of greater after tax wealth clearly is a positive catalyst for price appreciation. De-regulation. As mentioned, the finance sector has always been an important driver of NYC real estate prices. With a potential decrease in some of the regulations that have encumbered the big investment banks for the past several years, one would expect profits and compensation to rise. This would not only result in an increase in bankers’ disposable income, but in the value of their deferred stock which has languished for the last several years. This has already begun to play out, as bank stocks have risen dramatically since the election. Wealthier financiers (and those in correlated industries such as law and accounting) usually means a boost in the bid for high end properties. In addition, depending upon how any de-regulation is implemented as well as what’s in store for the Freddie Mac and Fannie Mae, an increase in the appetite of banks to originate new mortgages may result. Greater mortgage underwriting and a potentially less onerous process clearly would benefit real estate activity. Mr. Trump’s new Treasury Secretary already has mention this as a priority focus. Interest rates. It’s been highly publicized that 30-year mortgage rates have risen by roughly one percent since Mr. Trump was elected. While not a helpful development, unless rates rise significantly more, the expected tax cuts will more than absorb this added expense. When you factor in that many NYC buyers are “all cash” and/or have liquid assets well in excess of their mortgage, this rise in rates also has a positive effect–buyer’s fixed income investment opportunities have improved. The Dollar. This is a very interesting situation. Much has been made of the foreign bid for NYC real estate, and appropriately so. Since Mr. Trump’s victory, the Dollar has strengthened materially, and many expect this to continue. Parity with the Euro and maybe even the Pound may not be far off. This, in theory, will hurt the foreign bid for property in the United States. After all, the purchasing power of non-US buyers clearly has fallen. However, that said, don’t underestimate the power of fear as a driver of investment decisions. In this case, the fear of a further devaluation of non US dollar currencies can be an amazing catalyst for continued accumulation of US dollar assets. Macroeconomic conditions. The details of Mr. Trump’s policies and their long-term impacts are yet to be seen, but the equity and currency markets’ reaction suggest an increase in economic activity certainly is possible. Job creation, wage growth, and a boost in consumer confidence are positives for real estate acquisition. Asset appreciation. The stock market has appreciated by over ten percent since Mr. Trump’s victory, and many believe further increases in the near term. Wealth creation through higher investment returns means not only greater purchasing power, but provides the psychological benefit of feeling more financially secure. This confidence is important in taking on the responsibility of buying a home, and quite often, the mortgage payments associated with it. Geo-political risks. This is a wild card. Should Mr. Trump’s sabre rattling not result in a destabilization in global affairs, this concern simply will remain as one that has existed for the past two decades. If, on the other hand, terrorism, tensions, and the risk of trade wars increase, this could be a real negative for all risk assets. A potential silver lining? Quite often, people revert to investing in their homes in times of crisis, and a fear trade likely would push Treasury (and subsequently mortgage rates) down. Mr. Trump has yet to formally take office, and as such it’s a bit premature to reach any broad brush conclusions. However, when you look at the potential direction of public policy, I think the potential effects on real estate values gives reason for optimism. 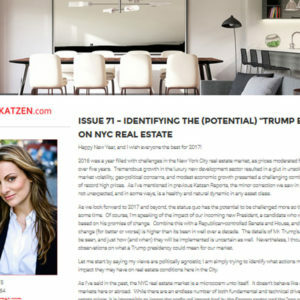 Love him or hate him, Donald Trump could be just what the doctor ordered for the moderation we’ve seen in NYC home prices and transaction volume over the last two years. Again, best wishes for a healthy and happy 2017, and I look forward to speaking with you soon. Issue 70 – Where do we go from here?